Mica Lodge in Revelstoke, British Columbia: One of the best winter experiences in Canada is heliskiing, and Mica Lodge is ensuring you’ll get the best of everything else, too. Arrival to this remote boutique lodge is by helicopter only – although there is a snow cat to get around on those rare no-fly days. The main building houses 12 guest suites, while private heliski groups bunk in the log chalet next door. The lodge has a rooftop hot tub for you to soak in the silent surrounds, and both lodge and chalet offer private massage quarters. When it’s time to hit the snow, there are three helicopters for the maximum 20 guests at Mica, to tackle the dizzying 1295 square kilometres of terrain on offer. The lodge’s Rocky Mountain cuisine features organic meat, alongside a first-class wine list and an enviable array of single-malt whiskies. Various packages are available, including the four-day ‘Classic Program’ for two. When comfort is key, Robert Upe says these Canadian lodgings rule the roost for a winter stay. 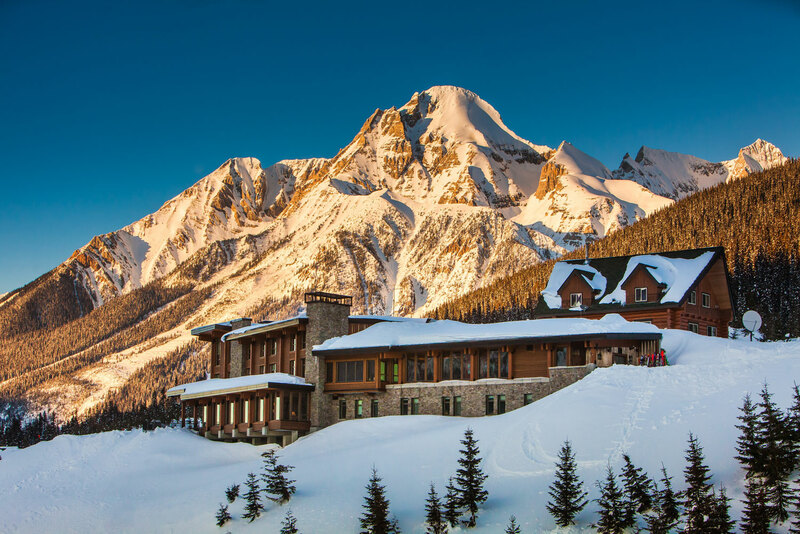 This lodge, near Marmot Basin ski area, is a winter holiday destination unto itself, with a 100-year history that has included guests such as Marilyn Monroe and Bing Crosby. Set on 300 hectares where elk roam beside a lake, this newly-renovated property maintains its retro 1950s ambience, which still makes you feel like you could walk around a corner and bump into Marilyn. It is a place of warm log fires, sessions in the day spa and strolling through the woods. Snowshoeing, ice-skating, an indoor/outdoor heated pool and nine restaurants are also on the agenda. The heritage Canadian log cabins are the pick of the 446 rooms, including Outlook Cabin, where queens and kings have stayed. From $C470 per night for a basic room for two adults in January 2017. Originally built in 1888, this hotel is in the style of a Scottish baronial castle. There are stories of ghosts in the corridors, but all we find is superlative service and warmth in interiors that include sweeping staircases, chandeliers, grand sitting rooms, archways and antique furniture. There are many and varied restaurant choices at this five-star hotel – Bavarian and Japanese included – but the plates that stand out are found at the fashionable 1888 Chop House. Here, everything is made in-house, and much of the produce is sourced in Alberta and grilled on cherry wood. Diners are wowed with plates of bison tenderloin, elk rib-eye, beef wagyu and East Coast lobster. From $C479 per night for a basic room for two adults in January 2017. One of the best winter experiences in Canada is heliskiing, and Mica Lodge is ensuring you’ll get the best of everything else, too. Arrival to this remote boutique lodge is by helicopter only – although there is a snow cat to get around on those rare no-fly days. 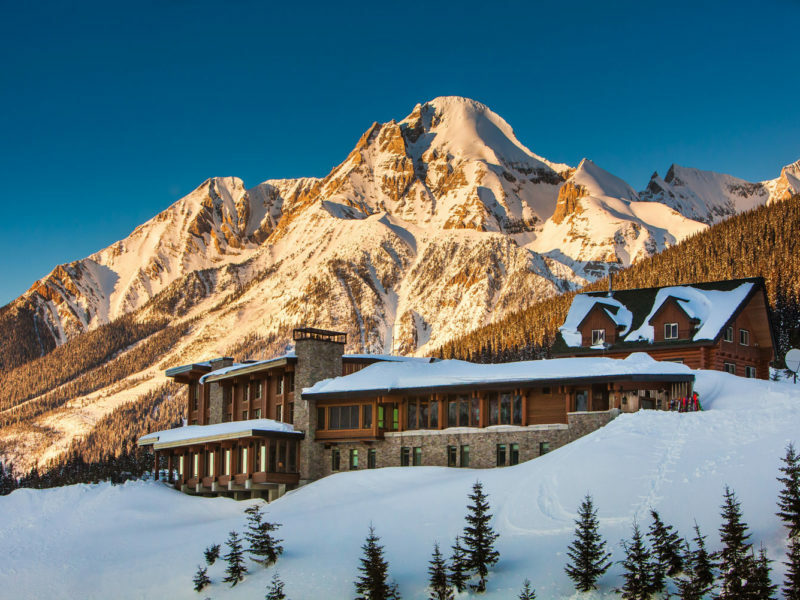 The main building houses 12 guest suites, while private heliski groups bunk in the log chalet next door. The lodge has a rooftop hot tub for you to soak in the silent surrounds, and both lodge and chalet offer private massage quarters. When it’s time to hit the snow, there are three helicopters for the maximum 20 guests at Mica, to tackle the dizzying 1295 square kilometres of terrain on offer. The lodge’s Rocky Mountain cuisine features organic meat, alongside a first-class wine list and an enviable array of single-malt whiskies. Various packages are available, including the four-day ‘Classic Program’ for two. Instead of a helicopter, guests staying here access backcountry terrain in heated oversnow vehicles. Island Lake Lodge is one of Canada’s most highly rated catskiing operations. Powder aside, part of the experience is the lodge life. Pampering – in the form of massages, a day spa and hot tubs – is on offer and there’s a social log-cabin ambience. You’ll also appreciate a 3000-bottle wine cellar and fine dining, based on French-inspired Rocky Mountain cuisine. If you like it you can even buy the cookbook! From about $C3000 for three days of skiing in the Lizard Mountains (average 12 runs per day) in January 2017. You’ll feel like you are in a fairytale when you look out the window of the lakeview rooms. There, on the frozen-over lake, people are ice-skating and enjoying sleigh rides with a backdrop of snowcapped mountains and the Victoria Glacier in this spectacular part of Banff National Park. Inside, it’s all about cosiness, with a traditional afternoon tea of pastries and finger sandwiches as you enjoy the view view of the chilly outdoors. There are 550 rooms, multiple restaurants and a day spa. Lake Louise ski resort is a 15-minute drive away, and Banff town 45 minutes. From $C359 per night for a basic room for two adults in January 2017. Fairmont Chateau Whistler in Whistler, British Columbia. With the swish of a sabre sword, the top of a champagne bottle is decapitated and the bubbly flows, in celebration of a good day at Whistler. This technique of opening champagne, called sabrage, is just one of the indulgences at this exquisite, landmark ski-in/ski-out property. Aside from the usual winter comforts – open fires, day spa, piano bar – the hotel has ski valets to help you put on ski boots, as well as be there on the snow’s edge to carry your skis or snowboard back to the locker, and to hand you a hot chocolate. From $C599 per night for a basic room for two adults in January 2017. There’s a roaring log fire and a 15-metre high window in the triple-height ‘great room’ of this indulgent timber ski chalet. The chalet holds eight suites for 16 guests, and has its own helicopter pad, high-tech cinema room, wellness area with gym and pool, a snooker table, hot tubs, a sophisticated bar area and an elegant dining room. The food is at gourmet level. The lodge has been voted the best ski chalet at the World Ski Awards for the past three years. As for the skiing, the daily choice is to go heliskiing or tackle the slopes of Revelstoke. Decisions, decisions. From $C90,000 for seven days’ exclusive use of the chalet (get a group together) in January 2017, with seven staff on hand.